A payload is the part of the satellite that performs the purpose it was put in space for. There are many different types of satellite but communications satellites are the kind we are interested in here. The payloads on communications satellites are effectively just repeaters. They receive the signals that are transmitted to them and then retransmit them at a different frequency back to earth. Modern may do more than this. They receive the signals and then sometimes demodulate them to access the data, the data can then be processed before being modulated and retransmitted. The data can be stored for later retransmission or switched to a different antenna and retransmitted at a different satellite band or modulated using a different method, even at a different data rate. 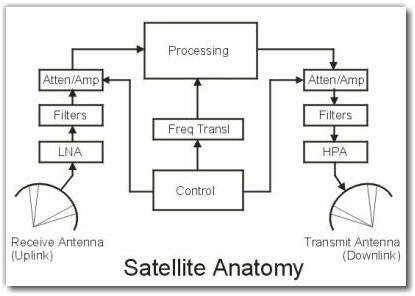 The accompanying picture shows an anatomy of a typical satellite. You can see the uplink receiver chain and the downlink transmit chain. The central area shown as 'Processing', is where the frequency is translated or any demodulation, processing and modulation would take place. These are the basic main components of a satellite and form the payload. The reality is that most satellites have many different antenna with separate transmit and receive chains. These have back up and redundancy built in so that in the vent of failur all is not lost. The gain of the on board transmitter amplifiers, configuration of which antenna they are connected to and even where on the earth the antenna are covering is all controlled from the satellite controllers on earth. These are complex and versatile satellites and are in use doing the job they were intended for 24 hours a day 365 days a year for many years. They eventually fail due to worn out parts or lack of fuel which is used to keep them stationary so we don't have to follow them about with our dishes. They stay put because they are manoevered by the controllers who constantly monitor and adjust the satellite. Now that we have seen how satellites work and how the satellite terminals work we can take a look at the applications of this technology and why it is so important. The Satellite Communications Engineering Resources Website.